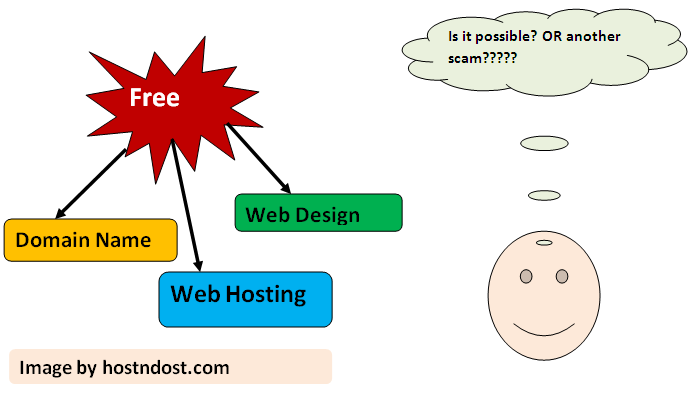 Welcome to the exciting and important ever tutorial on web hosting by hostndost. Today we will see how you can get free web hosting 0$, Free Domain Name 0$ and Free web design at no cost. Yes, it is true and you can get it quite easily. No credit card, debit card or online payment is required because it is free. Let's read line by line to make sure what we mean by saying that or what exactly is the free web hosting and other things. Free web hosting 0$ - How to get? Yes, you can search on google and you will get plenty of options those are offering free web hosting. To save your time we have mentioned few for you. Plans - Along with the free plan, you will see other plan or plans at the different price as well. Now my question to them is why do they have other plans if their intention to give everything free? The trap is ready - Once you will be ready for using their free service and your website will get a good traffic they will hammer you with bandwidth limit, account suspension or system resource limitation problem. They will ask you to upgrade and pay the amount if you want to see your website live. Now I hope you understood why they have other plans and how they are trapping innocent people? Ads show up - The other disgusting fact is they will show ads on your website, and make money off your hardworking. You can't monetize your website or blog because you are using free services and again upgrade to become a boss of your own stuff. Now, what do you thing? Will you go for this option? Because we heard somewhere " Free is not at all free, and it will cost you double". Let's see the second method and decide what you want to do? We will cover the second method of both free web hosting and free domain name after covering the domain name registration. Free domain Name 0$ - How to get it? We have seen that nothing has been given free by any web host. Now let's check whether or not free domain name at $0 is available or not? We have listed down few free domain name 0$ registration websites. If you will cross-examine the truth of the above websites or any site that you will find on google will show you the true color upfront or will fool you by other ways. Dot.tk - will show you that you will get free domain name with .tk extension but during the signup process, they will hang you up. Zoho - They will give you free .in extension but only in dreams. Go and check the reality of their free .in extension. Don't trust anybody just cross verify by your own and find out the truth. In very simple term understand the fact " Will you do business by giving everything for free? Or you will attract others via Free marketing?". You will get it free of cost - Get your blog or website free of cost. We will not give you free - You will get it free, and we will charge the money but not from you. Now question is if you will get everything at free of cost, then who will pay for you? Because we are not your friend or relative who will bear all your online journey expenses. Let's cut the long story short and come to the point. Referral Program - A simple give a take formula. Refer 5 people (friend, neighbor, relative or network person) who want website or blog at very low cost. 5 paid referral X $550 = Free web hosting + free domain name + free web design for you. In $550, they will get web hosting for the lifetime and domain name for 3 years. No limit for web space, bandwidth or system resource limitation. After 3 years, the domain name renewal will be at just $15/year. Which is a mere amount as compared to any top web hosting providers. Note: Since it is a one-time payment and hence you will get the everything free for 5 years, and after that have to pay $15/year for the domain renewal. This program is popular and easy to manage for you and your referral as well. Your website or blog will be free for the time your referral is active with us. Unlike one-time payment option here you need to manage three active referral only. 3 paid referral X ($25/year + $ 99(our services charge) = Your free website or blog. Yes, your referral will just pay $99 once for web template design, web hosting, and website setup fees. After that they will just pay $25/year which is again more cheaper then any trusted web hosting service providers. Note: Here, you will not pay anything as long as your 3 referrals are live. In case, one will not renew then you have to either pay $25/year or refer one to complete three referrals. We have just seen how one can get free website without paying anything or mentioning the debit or credit card information. Just refer and earn free website for your online dream. Just remember do not try to trick up because it will cost you a free website. In case, you have got any query then do write to us or contact us. We will try to resolve your query in few working days only. If you liked our tutorial then do share it with your friends or within the network. Get website @ $0.01/first month. Create Blog/website in 5 Minutes. Get 1 year web hosting free.